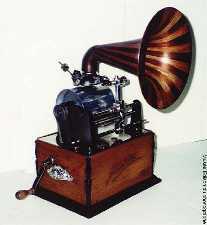 I bought my first cylinder phonograph in 1970 at an antique dealer in Quebec City, for $135.00. It was two years after my arrival in North America, and I bought it because of a friend who told me where it was and insisted for me to go and see it. 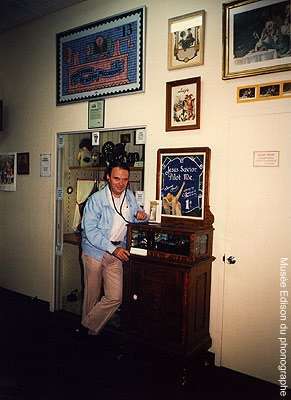 It was an EDISON Standard Model D, with an H reproducer and no horn , but with "only" 17 Edison 4 Minute Blue Amberol celluloid cylinders. Only is important because it is when I tried to find more cylinders that my life tilt up to sink into the ins and outs of the acute collecting. 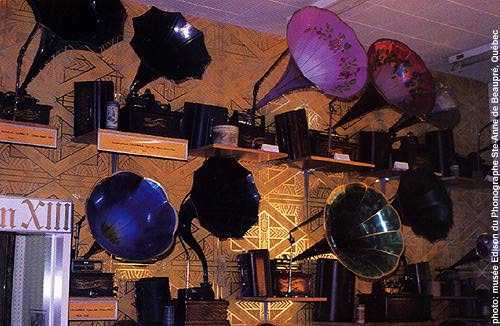 The next cylinders I was put forward were, of course, 2 minute wax ones with, above all, a COLUMBIA Graphophone Type BK. Thinking having solved the question, I bought it, being sure to have in my hands a sample of each type of cylinder machines ever put on the market. Tinfoil Phonograph which belonged, if my information is right, to Emile Berliner, the co-inventor, with Charles Cros, of the lateral reproduction of sounds. The mandrel is 5"½ (14 cm) of diameter and 6" (15 cm) long. Circa 1880. EDISON Talking Doll sold in 1889 with a Simon & Halbig German china head. 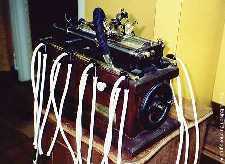 The small phonograph is hand driven, the speed being regulated by a small lead fly wheel. 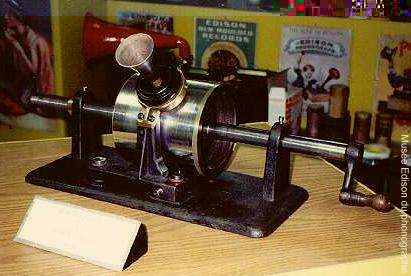 The wax cylinders, with a too big diameter compared to their small length, used to broke, due to the dilatation of the cylinder mandrel. The ones that I am reproducing have a metallic reinforcement. 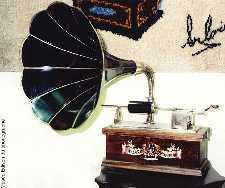 Local made English phonograph. The brass plate inscription is : " William Chas Tinson, The maker of this phonograph, Tongham, Surrey, 1896 ". This hand driven machine is equipped with a 10 ear tubes ramp, proving that it has been made for a lucrative purpose. BETTINI phonograph, model No 4, for Standard and Concert size cylinders. The horn made with alternate oak and mahogany twisted petals is a reproduction made as close as possible of the original. 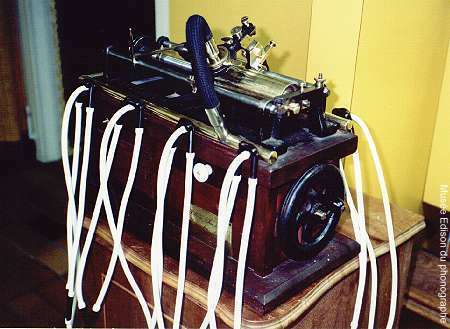 Graphophone COLUMBIA, Type BS. The less expensive coin-op cylinder machine sold in the U.S.A. between 1898 and 1905. 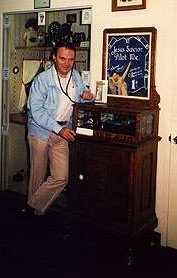 Usually provided with a pair of listening ear tubes, it is shown, here, with a quite rare zinc horn. 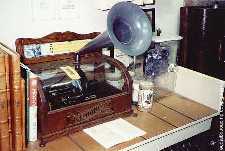 WIZARD Phonograph made in 1911 by the International Phonograph Company of Newark, New Jersey. One of the rare American machines of the European reversible type. 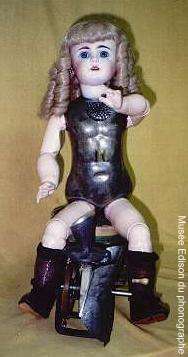 The mandrel and its axis are removable. The cylinders is moving in front of the fixed reproducer. The Edison Windsor made in 1906. This slot machine has an electric Class-M mechanism. 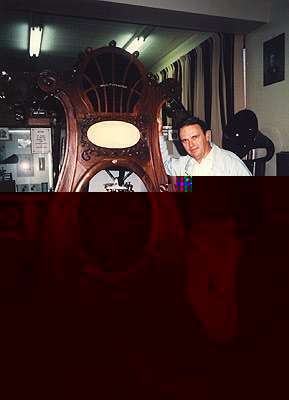 The oak cabinet has beveled glass and eagle claw with human face feet.